Now that I’ve booked the flights to Europe to use some of the frequent flyer points I won at Problogger, I get to go into my very favourite mode: more detailed travel planning. Given that a totally new country to me, Iceland, is on the agenda, then that involves a lot of fun and fascinating research. Which I love! I was chatting with friends on the weekend and the subject turned to my trip planning, and one of them turned to me and said (looking somewhat quizzical): “What is there to do in Iceland?” Another friend jumped in with tales of people she knew who’d been there, but the question did remind me that it’s certainly quite recent that Iceland started to become a popular destination and it is certainly a very long way from Australia (over 15,000km, in fact. FAR!). The impressions I’ve had of Iceland until now (mostly from friends and bloggers I’ve known who’ve already been there) are of huge landscapes, ice (ha! ), Northern Lights and quirkiness (I did grow up listening to The Sugar Cubes and Bjork). Since nobody had ever told me anything negative about it, I decided on it as a destination without looking too deeply into what we might actually do there. In any case, despite the fact that this will be a family trip there are quite a few parts of Iceland that might stretch my comfort zone and my adventurous plans for Iceland are definitely still not decided – to be honest, I’m still getting my tongue (and keyboard fingers) around some of the long Icelandic names. This collection of possibilities are some of the shortlist. When I visited Finland one winter, I had several outings on a snowmobile (heading out for ice fishing was one of them) and despite being nervous the first time – and I think the third time too, when the group we were with drove across some dodgy ice and the leader sank a bit – I really did enjoy it. Now, I’m not yet convinced I’m ready to take my son on a snowmobile although I’m sure kids who grow up in climates like this do it way before they’re five – and some of the tours you can do are happy to take kids at that age. He would love it, of course! 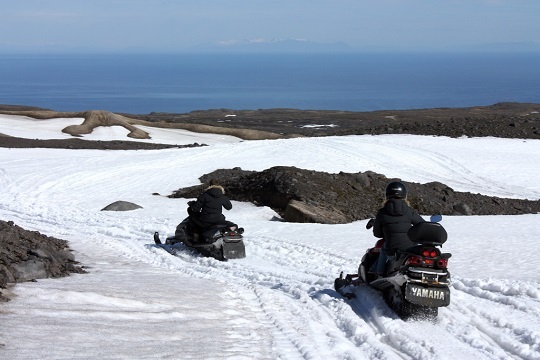 And apparently even in summer you can do snowmobile trips to the Langjökull glacier (obviously not a place that ever melts!). Now, I ordinarily wouldn’t really consider whale watching as something that lands in the adventure travel list but Google kept telling me it was and who am I to argue, especially since I just had my best ever whale watching experience (on the Gold Coast), but did it alone, and wished so much that my husband and son could have been there too! Perhaps Iceland will be the place where we all get to enjoy whales together – it seems that we are going at the right time of year for the most likely sightings. Right. 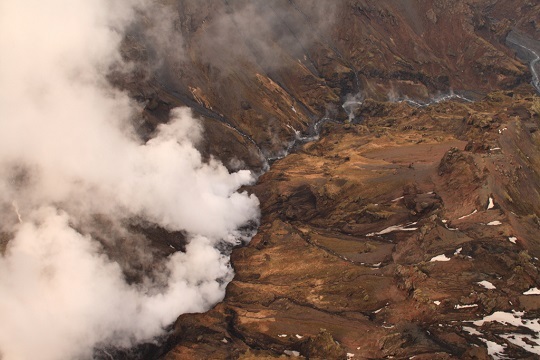 Well, to my surprise, there is such a thing as a trip to see a volcanic eruption (depending on there actually being an eruption; but it seems that at any one time, somewhere in Iceland, your luck is probably in). There are multiple possibilities for such trips in fact, including small planes or helicopters. As far as I’m concerned this definitely fits in the adventure category because I’m instantly concerned. Yet I know that my son would be both terrified but absolutely fascinated, as he has a real thing about volcanoes (one of those preschooler interests that seems to come out of nowhere). I have long been wanting to take another helicopter ride – the only one I’ve ever done is getting close to twenty years ago, and was a brilliant one over Uluru (Ayers Rock) and Kata Tjuta in Australia’s Northern Territory. But there was no lava action happening there, just some beautiful (stationary) rocks. Hmm. I will have to run this one by my husband! As soon as I saw that sailing possibilities include amphibious boats I knew this had to go on the list. I recently told my son that such a thing exists and he was utterly fascinated. 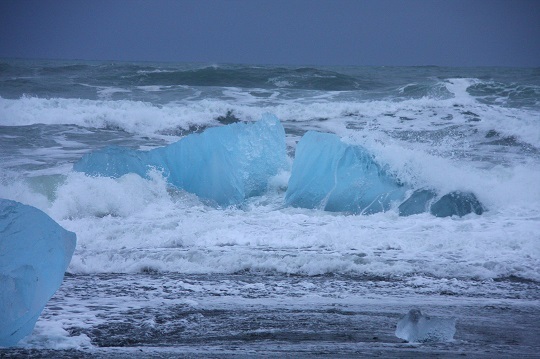 I found some at the Jokulsarlon Glacier Lagoon and I am totally hooked on the idea! If he was older we might even look at some of the kayaking tours I read about – they call them “calm water kayaking” because otherwise I would totally freak out – but the pictures of the scenery you pass through look totally amazing. 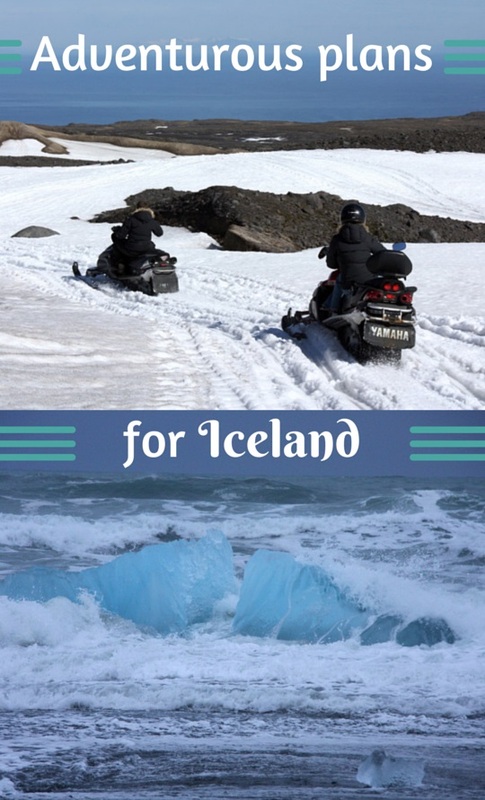 Given that our son will only be five years old when we head to Iceland, there are a bunch of activities that are definitely not on the cards. This is good in a couple of ways: one, I don’t have to test my adventurous streak too far (I really don’t think it’s a very big one!) and two, it means we have slightly fewer decisions to make … although the more I read the more I realise I could happily stay in Iceland a month rather than a week or so. But among the “in the future” list include some of the caving tours they have, and quad bike rides (I didn’t even check if they take kids that age – I just don’t want him to be on one yet! ), and also the great four-wheel-drive “super-jeep” tours I’ve read about, largely because they’re mostly really long days and I think they’d be too much for him. Apparently you can also go snorkelling off Iceland which looks beautiful but I can’t help but think the water must always be cold, right? So it’s a good thing my son won’t be a strong enough swimmer for such an activity by then! And there are Viking horse-riding tours … but none of us can ride a horse (and in my case at least don’t have a major desire to do so) so it doesn’t make the shortlist this time either. Any suggestions for being adventurous in Iceland? 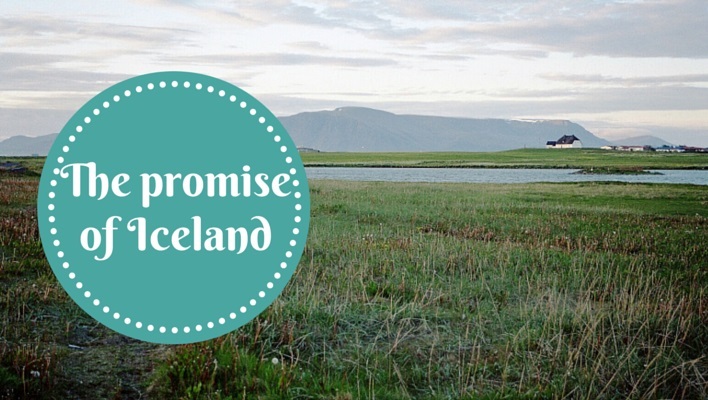 Some might say choosing Iceland as a destination is adventurous enough in itself. But do you have any ideas for how we can best enjoy our time in Iceland? I’ll be posting about some of the other aspects of planning our Iceland trip over the coming months and I am always very open to suggestions and ideas! Disclaimer: This story was brought to you by Cover-More Travel Insurance, but as always, it’s all my own ideas and opinions. One thing I wished I could have done was go and see the puffins but sadly it was the wrong time of year. We got to see the Northern Lights but no puffins … I guess you can’t have it all! I’m not exactly sure when you are going to Iceland but if you are there between the beginning of May to end of August this may be an option. I’m not sure that it quite fits in the adventurous category but it would definitely have the cute factor. Oh Zoe!! Puffins!!! Yes we’ll be there during that time so I definitely must investigate this. We will definitely miss the Northern Lights but puffins would be a great substitute … I’m not eating one though. I heard people do that! Oh, too bad you didn’t make it – although Norway is still a good place to be too! I can’t wait to get to Iceland, although the planning is exciting too! I was just there this year but it was the wrong time (our winter/their summer) to see the lights, unfortunately. I got out and saw a bit of the country but didn’t really do anything overly adventurous, so I’m curious to see what you end up doing. Ah, that’s the same time of year we’ll be there. Did you do a driving trip on the Ring Road? Still trying to figure out all the many possibilities! Come on Aleney, the more the merrier! Yes I’ve long wanted to get there too – can’t wait. OMG. Sign me up for all of these please!!!!! You guys should meet us there Bethaney! I’m sure you’re right Franca, boredom definitely won’t be an issue in Iceland – I love going to places which are a bit different so I’m especially excited about this trip. Thanks for stopping by! Ooh, I’m jealous. Iceland is SOOOO on my bucket list and was in the early plans for next year’s trip to Europe but now it looks like I won’t get there until 2016. I’ll definitely be checking out your post-trip posts to read all about it. Like you, I’m not super-adventurous but would love to see some puffins, the Blue Lagoon and Reykjavik. Haha Carolyn don’t worry, 2016 is not that far away and you will get the benefit of my experience first! I agree – puffins and Blue Lagoon are must sees for me. Can’t wait! Thanks Sonia – I will definitely be reporting back in depth! Can’t wait!! When I saw the title I was immediately sucked in! You’re right – Iceland has only recently come onto the radar tourism wise – I wonder whether being featured in the Geography of Bliss, which many people put down as being too stereotypical, but I confess I found viewing light hearted generalisations of the happiness of nationalities quite entertaining! Thanks Linda! Yes, it’s quite intriguing how Iceland has become quite prominent as a destination although I was surprised that its appeal isn’t quite as widespread as I thought – I guess my perspective is somewhat travel-biased! And I agree … stereotypical or not (and after all, stereotypes are grounded in reality or they wouldn’t be stereotypes), how bad can talking about happiness be?! We did Iceland as a short layover from America to Europe and while I wish we had a little bit longer like it seems like you have, we were blown away. I didn’t see your follow up posts but I trust you had an amazing time and you will just have to return for the magic of the Lights. Thanks Jen – we did have an utterly amazing time and are extremely keen to return some day!